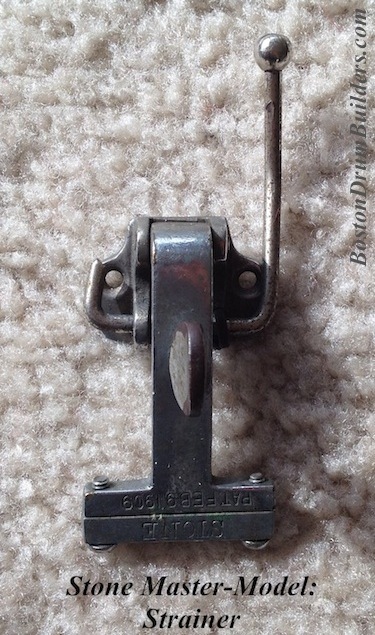 The snare throw-off used by George B. 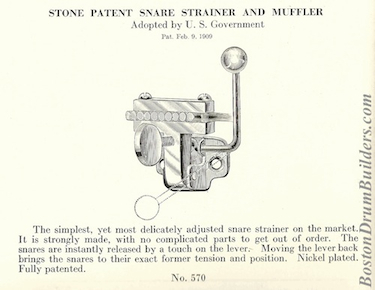 Stone & Son on the vast majority of their snare drums was that of a design by William F. McIntosh. (This is not the same MacIntosh associated with a line of early 20th Century drum bags. In that case, 'Macintosh' or 'MackIntosh' refers to a type of rubberized fabric.) 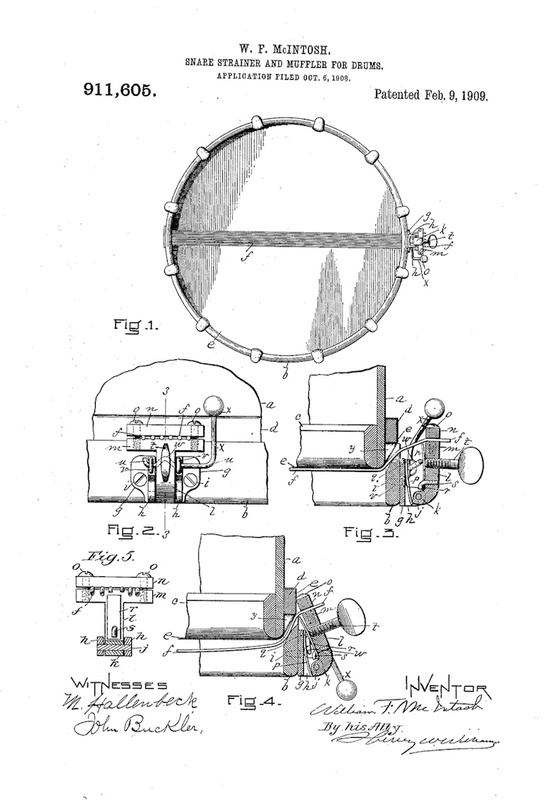 William McIntosh applied for a patent of his "Snare-Strainer and Muffler for Drums" on October 6th, 1908 which was granted on February 9th, 1909. 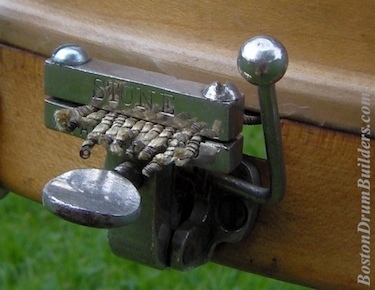 Note that the term "muffled" at that time referred to a drum without snares, not a drum with the heads dampened as would be expected today. Examples used on Stone drums typically were stamped "STONE" and "PAT. FEB. 9, 1909" as seen below. 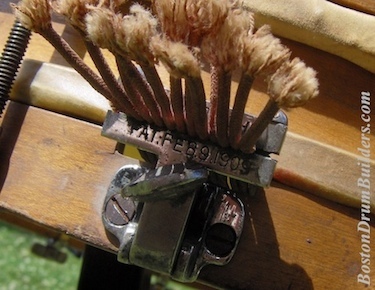 (Note that the strainer pictured at below, left is missing the lever used to engage and disengage the snares.) The McIntosh strainer could also be purchased separately and sometimes surfaces as an after-market modification to early 1900s snare drums. These examples are not normally stamped with the Stone name so as not to confuse the make of the drum. The Stone Master-Model Drums featured an elongated, inverted version of the McIntosh design (below, left). 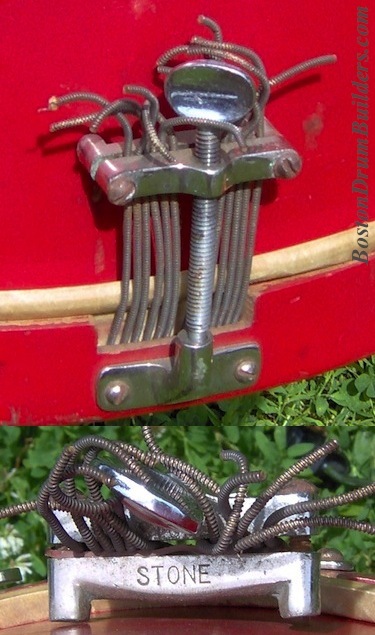 Other Stone snare drums, especially the street drums and lower end models, employed a more basic "long model snare strainer" (below, right) which was only capable of adjusting the tension of the snares without the ability to quickly engage or disengage the snares from the bottom head. Do you have a drum made by Geo. B. Stone & Son Inc.? I want to hear from you! Send Lee an email at lee@vinson.net.